John Magat, also known as Shy Guy, and Tsuyoshi Takayama are fairly new to the partner thing. The two lockers (lockers as in the hip-hop dance) had known each other from one-on-one battles, but they only linked up this past March when Tsuyoshi was asked to perform at a fundraiser. 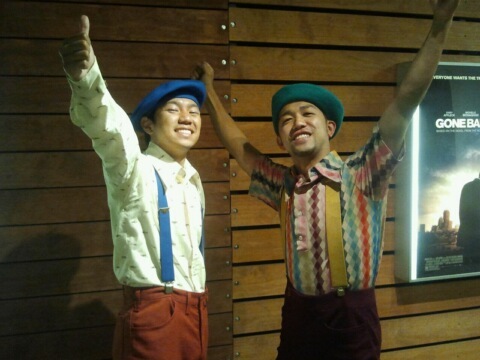 In June 2011, the two danced together again at the “Keep It Live 3: Locking Showcase,” and decided to form Shyoshi (a combination of their names). At “Keep It Live 3,” Emiko Sugiyama spotted the duo and asked them to apply to perform at this year’s J.U.i.C.E. Hip Hop Dance Festival, which she has produced for two years. According to Shy Guy, when he first started competing and seeing Tsuyoshi around, it was rare to see other lockers — more people gravitated to popping and breaking. When he did run into other lockers, he noticed they stuck to a distinct style of locking. Their interpretation of locking has a few influences. For Shy Guy, it’s his friends who do other styles that push him to step outside the box. He’s originally from the Bay area, and his crew, Soul Sector, consisted of dancers who each had their own style, which Shy Guy has not been afraid to incorporate into his own. Another inspiration is music. Shyoshi dance to all types of music: funk, house, hip-hop, break beats. Shy Guy even tried locking to Alicia Keys a few times, and rock ‘n’ roll. The L.A.-based lockers maintain an open mind when it comes to their craft. When Sugiyama called the group to ask if they would partner with Kiminari and Kairi, two dancers from Hiroshima, Japan, for the upcoming J.U.i.C.E. Festival, Shyoshi obliged. The two sets of dancers were supposed to perform as separate acts, but two of Kiminari & Kairi’s partners ran into problems acquiring visas. Watching the four dancers boogie to the beat on stage, showing off poppin’, lockin’, and straightforward hip-hop choreography, was a highlight of the festival. On October 7, 2011, Kiminari and Kairi delivered the 1,000 Origami cranes, made by the audience during the festival, to the Children’s Peace Monument in Hiroshima. The Monday after the J.U.i.C.E. festival, Shy Guy returned to his 9-to-5 in the marketing department of a software company. Tsuyoshi juggles part-time jobs, attends school while also auditioning for industry work. Shy Guy has come a long way since he received his nickname, and now it seems certain he’s locked into his style of dance.